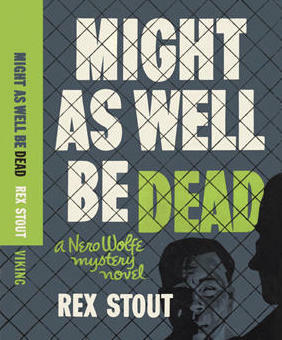 Synopsis: James R. Herold of Nebraska hires Nero Wolfe to locate his missing son, Paul Herold; believed to be in New York City. Wolfe and Archie Goodwin find him right away, going by the name of Peter Hays, and unfortunately on trial for Murder One; and quickly convicted. The victim, Michael M. Molloy, was found shot in his apartment. His wife, Selma Molloy, was apparently having an affair with Hays. Wolfe teams up with Hays' attorney, Albert Freyer, to see if this was a frame-up. The killer had opportunity when Selma went to the theatre with her friends Jerry and Rita Arkoff and Tom and Fanny Irwin. The question is who got her to go away and leave Molloy alone? While operative Johnny Keems go to ask them, he is run over and killed by a hit-and-run driver. Selma is in need of an administrator to handle her husband's estate, and asks friend Patrick A. Degan. The police had closed the case with the conviction of Hays, but reopen it when bodies continue to turn up as Wolfe gets closer to the real killer. Archie Goodwin again narrates a page turner, while resisting getting involved with the attractive widow. I did find it surprising the NYC police put such efforts into locating a missing person - who is an adult and wishes to remain missing. I don't think that would do that today. There is no appearance by Lily Rowan, a usual pleasant side attraction. The smoothly operating Wolfe household is always an incentive for me to clean up my office and dust my globe. On a sad note, this is the book in which one of Wolfe's regular operatives gets written out of the series.